Green cloverworm caterpillars (Hypena scabra) are present in most soybean fields from summer to fall. The caterpillars are green with a long white line on each side of the body. The migratory adults are common dark brown moths that are not easy to identify without training. 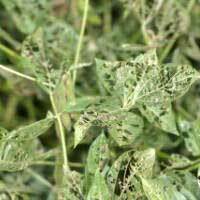 The green cloverworm is mostly found on legumes, with alfalfa and soybean the preferred hosts. Other hosts include dry beans, clover, cowpea, vetch, and many common weeds. 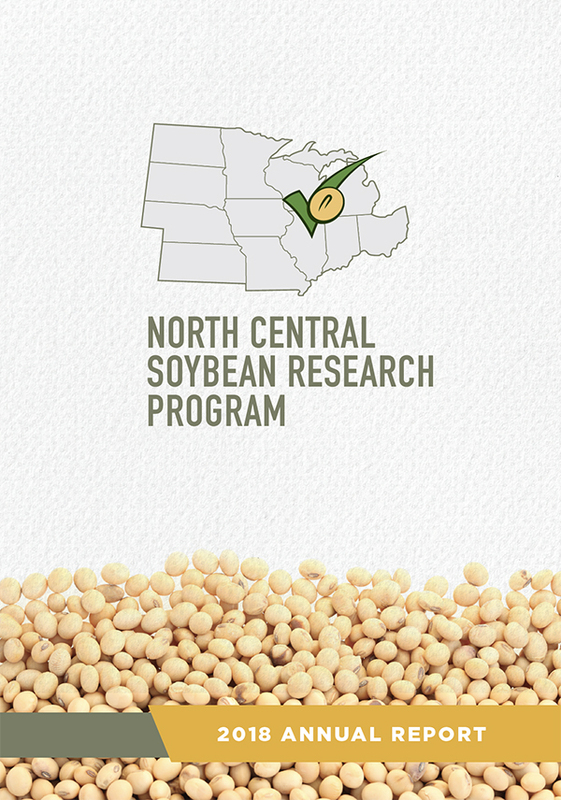 Damage to soybeans is caused by the larval stage which hatches in early summer. Feeding by the green cloverworm, although it can be extensive, does not generally affect yield, due to the ability of the soybean plant to compensate for leaf loss. Although common in soybean fields, especially in the southern states, green cloverworm is generally not considered a serious pest. Young larvae feed on soybean leaves and skeletonize the underside of the leaf. Older larvae eat all of the leaf except large veins. Green cloverworms feed mainly on the top third of the plant, giving the impression of extensive damage long before economic damage has occurred. Reductions in yield from insect feeding can occur during any crop stage, but the pod-forming and pod-filling stages are the most sensitive. In general, consider treatment of soybean only if leaf-feeding insects are present and defoliation reaches 20% in the pod-forming and pod-filling stages. The economic threshold during the vegetative stage is much higher, generally 35-40% or in some cases even 50-60%. A 40% leaf loss during any vegetative stage will result in only a 3-7 percent yield reduction. Defoliation of 20% during the pod-forming and pod-filling stages will result in similar yield reductions. 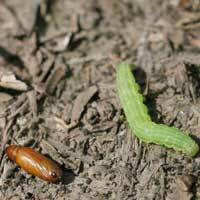 Green cloverworms overwinter either as pupae or adults. 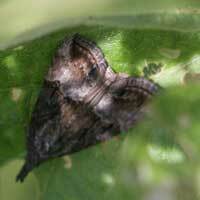 The moths lay their eggs in the spring on the undersides of leaves. The eggs hatch in a few days. Larvae may feed for several weeks until they burrow into litter or soil and pupate. Green cloverworm larvae are pale green with two narrow white strips along each side of the body. These white lines become faded when the caterpillars are fully-grown (about one inch long). 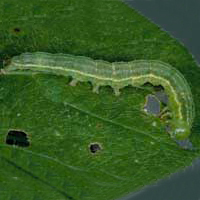 The green cloverworm looks similar to the soybean looper, except for the number of prolegs (short legs along the middle of the body). Cloverworms have three pairs of prolegs. Loopers have one or two pairs, and most other soybean-infesting caterpillars have four pairs of abdominal prolegs. Another unique characteristic used to identify green cloverworm is the tendency of the larvae to wiggle violently when squeezed; no other caterpillar in soybeans exhibits this behavior. Many entomologists recommend using leaf defoliation as the best gauge for making management decisions, especially in fields with multiple insect species feeding on the leaves. if other insect defoliators present. The green cloverworm has a broad distribution and is found in most soybean growing areas of the United States and southeastern Canada. Beneficial insects and diseases commonly regulate green cloverworm populations below economic injury levels in most areas where soybeans are grown. 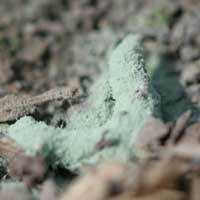 The green cloverworm is considered a good food source for a number of predatory insects. In parts of the deep South, green cloverworms are ignored or are sometimes considered beneficial because low populations are thought to serve as a food source for predators that later help hold more serious defoliators in check. 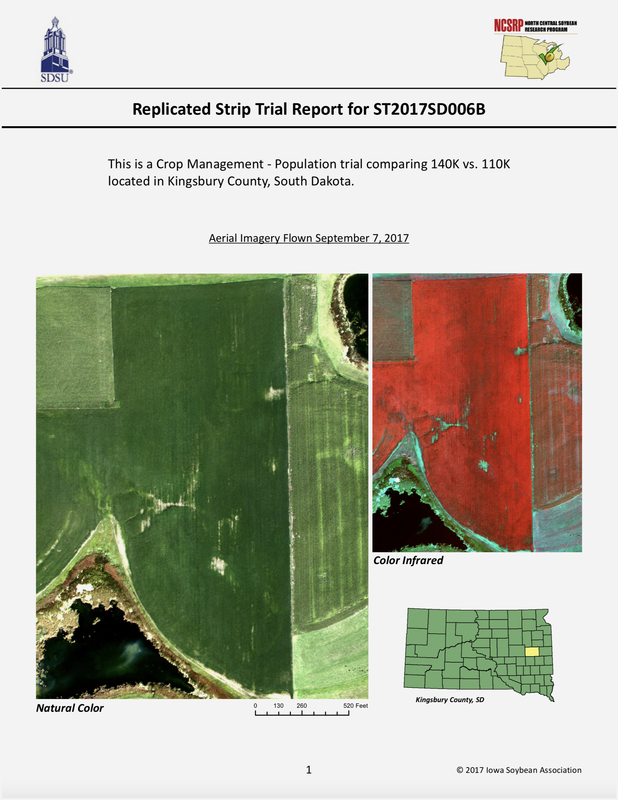 Dense cloverworm populations and moist conditions help encourage epidemics of a fungal pathogen that can eliminate even threatening population in a few days, without the use of insecticides. The epidemic spreads from mummified remains of parasitized larvae on the ground or up in the foliage. Large numbers of spores are released from the bodies and infect other nearly larvae, frequently leading to a total population crash in a period of days. Most entomologists recommend using leaf defoliation as the best gauge for making management decisions, especially in fields with multiple insect species feeding on the leaves.